Our stereofin bag is specially designed for needs of watersport athlethes: * the bag stows 2 pairs of stereofins and your swimming stuff; * it is made of strong and durable water resistant material with an easy-to-open zip and has two ventilation holes on both sides; * shoulder strap is easy to remove - enjoyable e.g. at checking in for your flight trips. 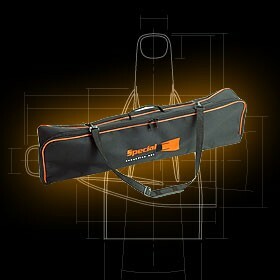 Stereobag measure is 100x25cm (length and width).